The organizers behind the U.S. Grand Prix revealed the first diagram today of a new 3.4-mile track in Central Texas that sports 30 turns, 133 feet of elevation change, a 0.75-mile long straight, and looks, appropriately, like a giant bong. The Austin U.S. Grand Prix course is being planned for a huge tract of land just southeast of Austin, Texas. Herman Tilike's designing the $200-million dollar track with, we're told, four main passing zones to make the racing more exciting than other facilities he's been involved with. 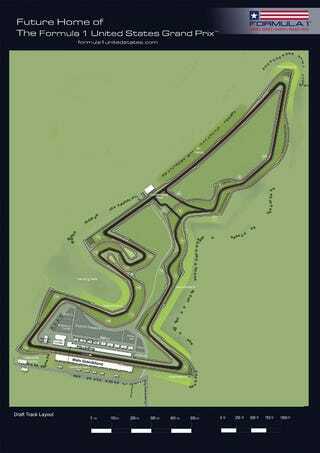 The course pays tribute to numerous other tracks including Silverstone, Hockenheim, and Istanbul. Construction should begin soon because they're expecting to have a race there sometime in mid-2012, giving them precious few months to start and finish what's intended to be a world-class facility in what's now just a big empty field. Given its proximity to Austin we're a little surprised it's not in the shape of a Longhorn but not shocked it looks like smoking paraphernalia. It's for tobacco. We swear, officer.